a) 21.11.1921, 1.000 Shares of Deferred Ordinary Shares á £ 1, #3244, 28 x 33,5 cm, schwarz, weiß, Knickfalten, Kapital: £ 511,243.7.0; b) wie a), nur 23.03.1923, 2.5000 Preferred Ordinary Share of £ 1, #5918, rot, weiß. 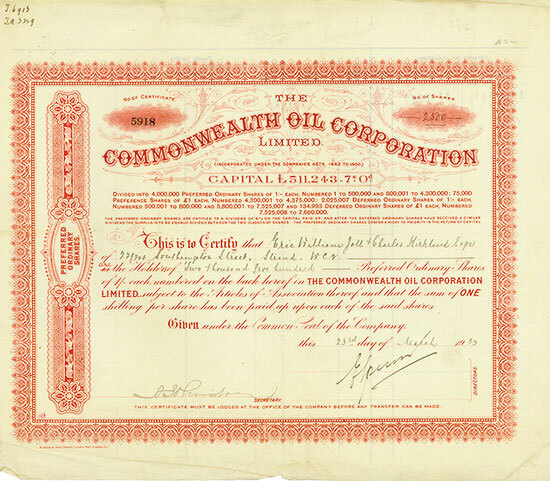 a) 21 November 1921, 1,000 Shares of Deferred Ordinary Shares á £ 1, #3244, 28 x 33.5 cm, black, white, folds, capital: £ 511,243.7.0; b) like a), only, 23 March 1923, 2,500 Preferred Ordinary Share of £ 1, #5918, red, white. Die Gesellschaft wurde am 8. Dezember 1905 gegründet. Die Gesellschaft besaß Schieferminen und Ölförderanlagen in Newnes, Torbane und Hartley Vale in New South Wales sowie eine Eisenbahnlinie (32 Meilen), welche die Förderstätten an die staatliche Eisenbahnlinie anband. The company was founded on 8 December 1905. It owned shale-mining properties and oil works at Newnes, Torbane and Hartley Vale, in New South Wales as well as a line of railway (32 miles) connecting the properties with the Government railway.